Free Shipping Included! 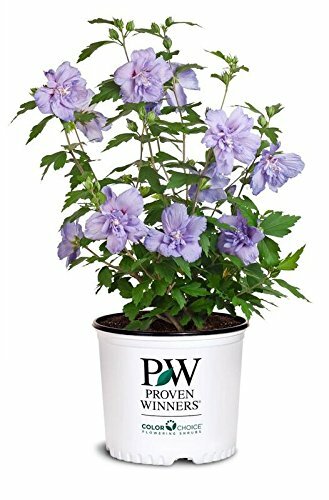 Proven Winners - Hibiscus syriacus Blue Chiffon (Rose of Sharon) Shrub, double lavender flowers, #3 - Size Container by Green Promise Farms at List It Fort Lauderdale. MPN: PWSHHSBCH03. Hurry! Limited time offer. Offer valid only while supplies last. This plant is grown on our nursery by experienced growers. We Check the roots, foliage, & water levels to ensure it arrives in great condition. For best results, plant in USDA Zones 5-8. Mature height is 8-16ft, mature spread is 6-8ft. Blooms profusely from July through September with lavender-blue flowers. Perfect plant to group to form an easy to maintain colorful hedge. Grows well in full sun. If you have any questions about this product by Green Promise Farms, contact us by completing and submitting the form below. If you are looking for a specif part number, please include it with your message.